Storyboards tutorial to get you started with designing user interfaces for your iPhone apps on iOS 7. Note from Ray: Tutorial Team member Matthijs Hollemans (the iOS Apprentice Series author) has ported this popular tutorial from iOS 5 by Tutorials to iOS 7. This is a sneak peek of the third edition of the book, which will be updated to iOS 7. We hope you enjoy! If you want to learn about storyboarding, you’ve come to the right place! In the first part of the storyboards tutorial series, you covered the basics of using Interface Builder to create and connect various view controllers, along with how to make custom table view cells directly from the storyboard editor. OK, let’s dive into some of the other cool features in Storyboarding! 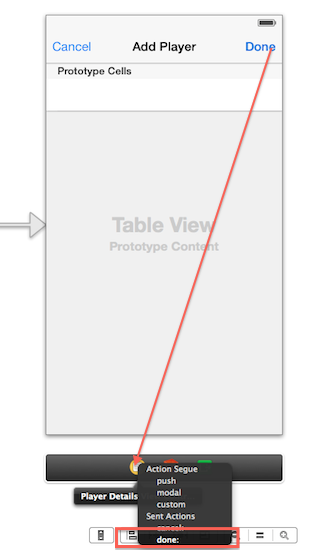 It’s time to add more view controllers to the storyboard. You’re going to create a screen that allows users to add new players to the app. Open up Main.storyboard and drag a Bar Button Item into the right slot of the navigation bar on the Players screen. In the Attributes inspector change its Identifier to Add to make it a standard + button. When the user taps this button the app pops up a new modal screen for entering the details of a new player. Drag a new Navigation Controller into the canvas to the right of the Players screen. Remember that you can double-click the canvas to zoom out so you have more room to work. 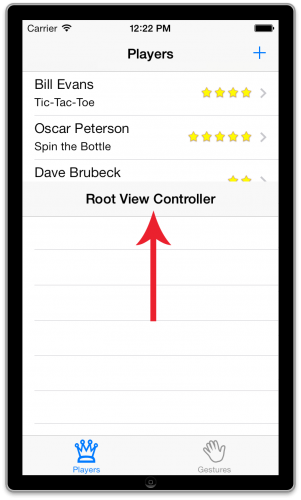 This new Navigation Controller comes with a Table View Controller attached, so that’s handy. This type of connection is known as a segue (pronounce: seg-way) and represents a transition from one screen to another. 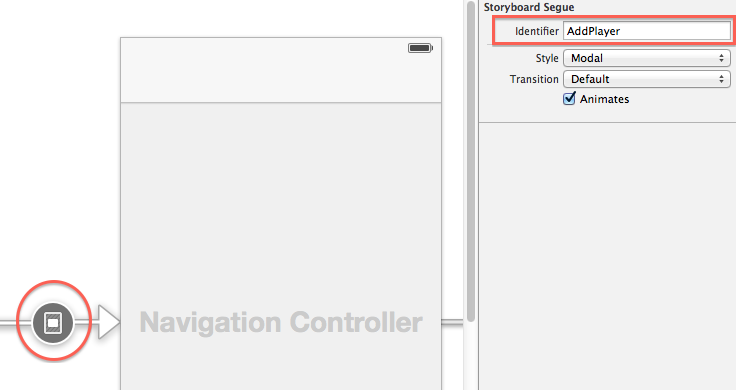 The The storyboard connections you’ve seen so far were relationships and they described one view controller containing another. A segue, on the other hand, changes what is on the screen. Segues are triggered by taps on buttons, table view cells, gestures, and so on. Run the app and press the + button. A new table view will slide up the screen. This is a so-called “modal” segue. The new screen completely obscures the previous one. The user cannot interact with the underlying screen until they close the modal screen first. Later on you’ll also see “push” segues that push new screens on the navigation stack of a Navigation Controller. The new screen isn’t very useful yet — you can’t even close it to go back to the main screen. That’s because segues only go one way, from the Players screen to this new one. To go back, you have to use the delegate pattern. For that, you first have to give this new scene its own class. Add a new file to the project and name it PlayerDetailsViewController, subclass of UITableViewController. To hook this new class up to the storyboard, switch back to Main.storyboard and select the new Table View Controller scene (the one that says “Root View Controller”). 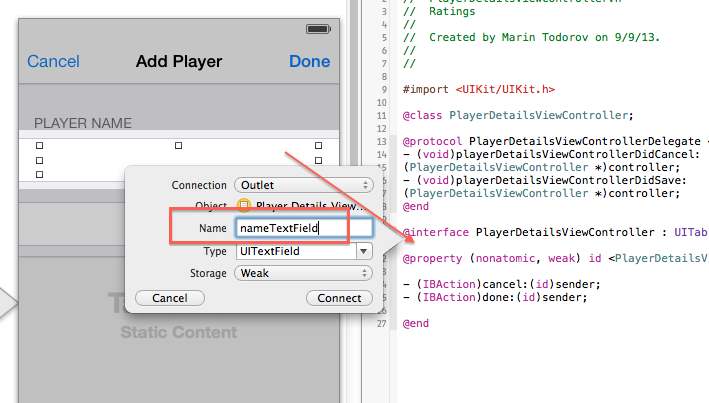 In the Identity inspector set its Class to PlayerDetailsViewController. I always forget this very important step, so to make sure you don’t, I’ll keep pointing it out. While you’re there, change the title of the screen to Add Player (by double-clicking in the navigation bar). Also add two Bar Button Items to the navigation bar. In the Attributes inspector, set the Identifier of the button to the left to Cancel, and the one on the right to Done (also change this one’s Style from Bordered to Done). This defines a new delegate protocol that you’ll use to communicate back from the Add Player screen to the main Players screen when the user taps Cancel or Done. Make sure you pick the cancel: and done: actions from the Sent Actions section of the popup menu – don’t create a new segue! Note: It is customary for delegate methods to include a reference to the object in question as their first (or only) parameter, in this case the PlayerDetailsViewController. That way the delegate always knows which object sent the message. Currently these delegate methods simply close the screen. Later you’ll make them do more interesting things. There is only one thing left to do to make all of this work: the Players screen has to tell the PlayerDetailsViewController that it is now its delegate. That seems like something you could set up in Interface Builder just by dragging a line between the two. Unfortunately, that is not possible. To pass data to the new view controller during a segue, you still need to write some code. 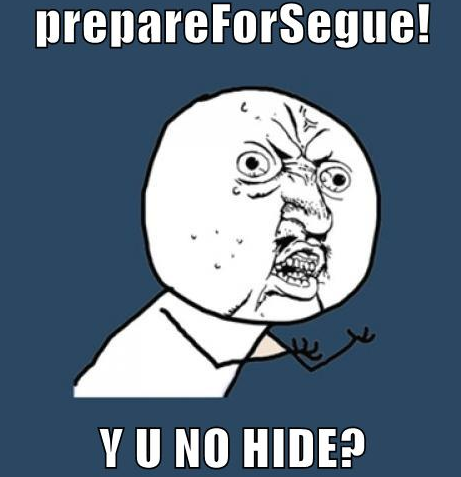 The prepareForSegue: method is invoked whenever a segue is about to take place. The new view controller has been loaded from the storyboard at this point but it’s not visible yet, and you can use this opportunity to send data to it. Note: You never call prepareForSegue: yourself. It’s a message from UIKit to let you know that a segue has just been triggered. The destination of this particular segue is the Navigation Controller, because that is what you connected to the Bar Button Item. To get the PlayerDetailsViewController instance, you have to dig through the Navigation Controller’s array of viewControllers to find it. That’s because you never gave the segue an identifier. The code from prepareForSegue checks for that identifier (“AddPlayer”). It is recommended to always do such a check because you may have multiple outgoing segues from one view controller and you’ll need to be able to distinguish between them (something that you’ll do later in this tutorial). To fix this issue, open Main.storyboard and click on the segue between the Players screen and the Navigation Controller. Notice that the Bar Button Item now lights up, so you can easily see which control triggers this segue. 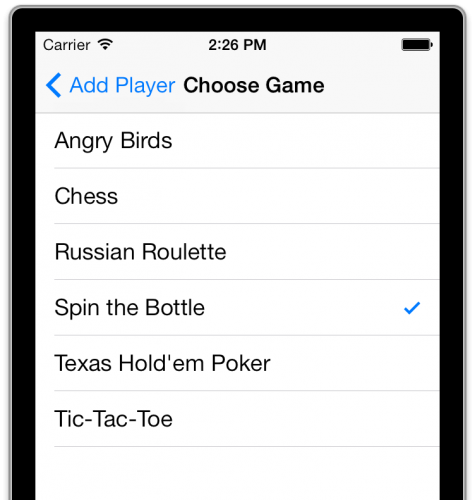 Run the app again; tapping Cancel or Done will now properly close the screen and return you to the list of players. Note: It is perfectly possible to call dismissViewControllerAnimated:completion: from the modal screen. There is no requirement that says the delegate must do this. I personally prefer to let the delegate handle this but if you want the modal screen to close itself, then go right ahead. Implement prepareForSegue: in the source view controller and do destination.delegate = self;. Delegates are necessary because — at least on iOS 5 — there is no such thing as a “reverse segue”. When a segue is triggered it always creates a new instance of the destination view controller. You can certainly make a segue back from the destination to the source, but that may not do what you expect. If you were to make a segue back from the Cancel button to the Players screen, for example, then that wouldn’t close the Add Player screen and return to Players, but it creates a new instance of the Players screen. You’ve started an infinite cycle of creating new view controllers over and over that only ends when the app runs out of memory. Remember: Segues only go one way; they are only used to open a new screen. To go back you dismiss the screen (or pop it from the navigation stack), usually from a delegate. The segue is employed by the source controller only. The destination view controller doesn’t even know that it was invoked by a segue. Note: Does creating a delegate protocol for each screen that you want to reach through a segue sound like a lot of work? That’s what the creators of UIKit thought too, so in iOS 6 they introduced a new concept: the unwind segue. With this new feature you can create segues that go back to the previous screen. That is what the green Exit icon is for in the storyboard. If you want to learn more about unwind segues, we’ve dedicated a chapter to it in iOS 6 by Tutorials. That’s a grouped table view, of course, but the new thing is that you don’t have to create a data source for this table. You can design it directly in Interface Builder — no need to write cellForRowAtIndexPath for this one. The feature that makes this possible is called static cells. 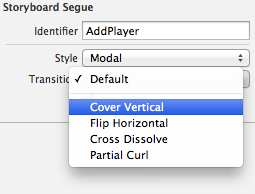 Select the table view in the Add Player screen and in the Attributes inspector change Content to Static Cells. 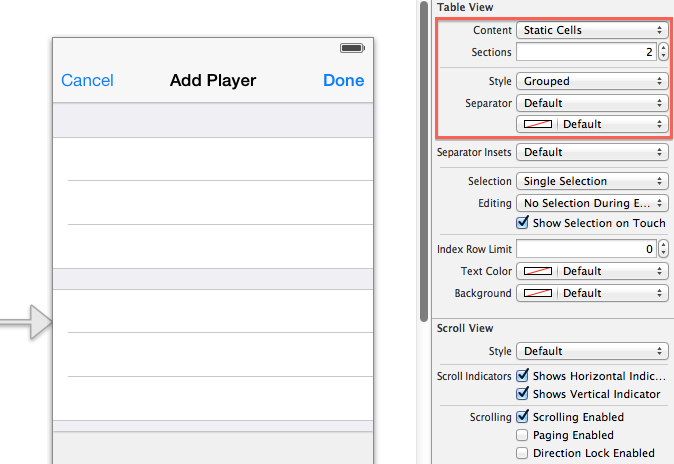 Change Style from Plain to Grouped and give the table view 2 sections. The finished screen will have only one row in each section, so select the superfluous cells and delete them. Select the top-most section (from the Document Outline). In its Attributes inspector, give the Header field the value Player Name. You’re going to make an outlet for this text field on the PlayerDetailsViewController using the Assistant Editor feature of Xcode. Open the Assistant Editor with the button from the toolbar (the one that looks like a tuxedo / alien face). It should automatically open on PlayerDetailsViewController.h (if it doesn’t, use the jumpbar in the right hand split window to select that .h file). Creating outlets for views on your table cells is exactly the kind of thing I said you shouldn’t try with prototype cells, but for static cells it is OK. There will be only one instance of each static cell and so it’s perfectly acceptable to connect their subviews to outlets on the view controller. Set the Style of the static cell in the second section to Right Detail. This gives you a standard cell style to work with. Change the label on the left to read Game and give the cell a Disclosure Indicator accessory. Tip: The screens you have designed so far in this storyboard all have the height of the 4-inch screen of the iPhone 5, which is 568 points tall as opposed to the 480 points of the previous iPhone models. You can toggle between these two form factors using the left-most button from the little floating panel that sits at the bottom of the canvas. Obviously, your app should work properly with both screen sizes. You can accomplish this with autosizing masks or the new Auto Layout technology from iOS 6. For the Ratings app, you don’t have to do anything fancy. It only uses table view controllers and they automatically resize to fit the extra screen space on the iPhone 5. Back to the Add Player screen. When you use static cells, your table view controller doesn’t need a data source. Because you used an Xcode template to create the PlayerDetailsViewController class, it still has some placeholder code for the data source and that will prevent the static cells from working properly. That should silence Xcode about the warnings it has been giving ever since you added this class to the project. Run the app and check out the new screen with the static cells. All without writing a line of code — in fact, you threw away a bunch of code! You can’t avoid writing code altogether, though. When you dragged the text field into the first cell, you probably noticed it didn’t fit completely. There is a small margin of space around the text field. The user can’t see where the text field begins or ends, so if they tap in the margin and the keyboard doesn’t appear, they’ll be confused. This just says that if the user tapped in the first cell, the app should activate the text field. There is only one cell in the section so you only need to test for the section index. Making the text field the first responder will automatically bring up the keyboard. It’s just a little tweak, but one that can save users a bit of frustration. You should also set the Selection Style for that cell to None (instead of Blue) in the Attributes inspector, otherwise the row appears highlighted if the user taps in the margin around the text field. For now you will ignore the Game row and just let users enter the name of the player. When the user presses Done, however, you should create a new Player object and fill in its properties. Then you should tell the delegate that you’ve added a new player, so it can update its own screen. The “didSave” method declaration is gone. Instead, there is now a “didAddPlayer”. This first adds the new Player object to the array of players. Then it tells the table view that a new row was added (at the bottom), because the table view and its data source must always be in sync. You could have just done [self.tableView reloadData] but it looks nicer to insert the new row with an animation. UITableViewRowAnimationAutomatic automatically picks the proper animation, depending on where you insert the new row. Very handy. If you’re wondering about performance of these storyboards, then you should know that loading a whole storyboard at once isn’t a big deal. The Storyboard doesn’t instantiate all the view controllers right away, only the initial view controller. Because your initial view controller is a Tab Bar Controller, the two view controllers that it contains are also loaded (the Players scene from the first tab and the scene from the second tab). The other view controllers are not instantiated until you segue to them. When you close these view controllers they are immediately deallocated, so only the actively used view controllers are in memory, just as if you were using separate nibs. You’re overriding the initWithCoder: and dealloc methods and making them log a message to the Xcode Debug pane. Now run the app again and open the Add Player screen. You should see that this view controller did not get allocated until that point. When you close the Add Player screen, either by pressing Cancel or Done, you should see the NSLog() from dealloc. If you open the screen again, you should also see the message from initWithCoder: again. This should reassure you that view controllers are loaded on-demand only, just as they would if you were loading nibs by hand. One more thing about static cells: they only work in UITableViewController. Even though Interface Builder will let you add them to a Table View object inside a regular UIViewController, this won’t work during runtime. The reason for this is that UITableViewController provides some extra magic to take care of the data source for the static cells. Xcode even prevents you from compiling such a project with the error message: “Illegal Configuration: Static table views are only valid when embedded in UITableViewController instances”. 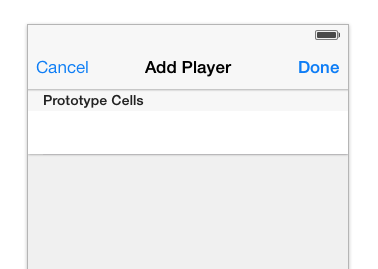 Prototype cells, on the other hand, work just fine in a table view that you place inside a regular view controller. Neither work for nibs, though. 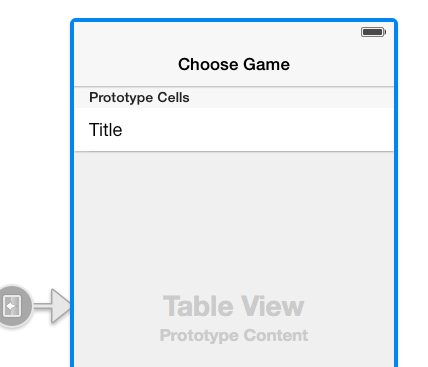 At the moment, if you want to use prototype cells or static cells, you’ll have to use a storyboard. It is not unthinkable that you might want to have a single table view that combines both static cells and regular dynamic cells, but this isn’t very well supported by the SDK. If this is something you need to do in your own app, then see this post on the Apple Developer Forums for a possible solution. Note: If you’re building a screen that has a lot of static cells — more than can fit in the visible frame — then you can scroll through them in Interface Builder with the scroll gesture on the mouse or trackpad (2 finger swipe). This might not be immediately obvious, but it works quite well. Tapping the Game row in the Add Player screen should open a new screen that lets the user pick a game from a list. That means you’ll be adding yet another table view controller, although this time you’re going to push it on the navigation stack rather than show it modally. Drag a new Table View Controller into the storyboard. Select the Game table view cell in the Add Player screen (be sure to select the entire cell, not one of the labels) and ctrl-drag to the new Table View Controller to create a segue between them. Make this a Push segue (under Selection Segue in the popup, not Accessory Action) and give it the identifier PickGame. 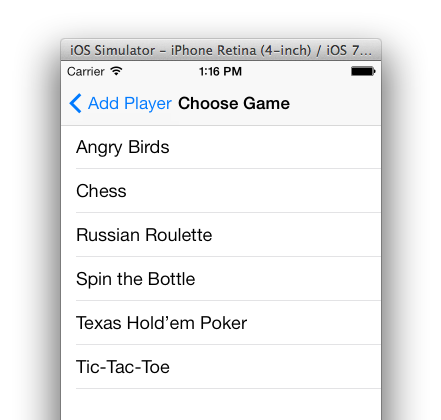 Add a new file to the project and name it GamePickerViewController, subclass of UITableViewController. 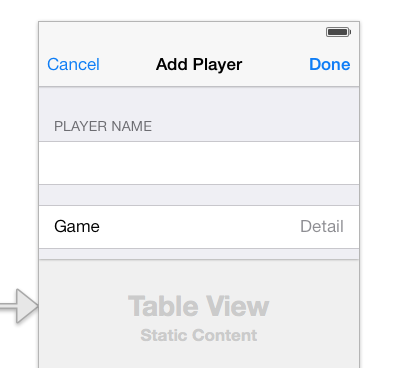 Don’t forget to set the Class in the storyboard so that your new GamePickerViewController object is associated with the Table View Controller. This is pretty cool, huh? You didn’t have to write any code to invoke this new screen. You just ctrl-dragged from the static table view cell to the new scene and that was it. You’ve added a delegate protocol with just one method, and a property that will hold the name of the currently selected game. The name of the selected game will be set in self.game. Here you figure out what the index is for that game in the list of games. You’ll use that index to set a checkmark in the table view cell. For this to work, self.game must be filled in before the view is loaded. That will be no problem because you will do this in the caller’s prepareForSegue:, which takes place before viewDidLoad. 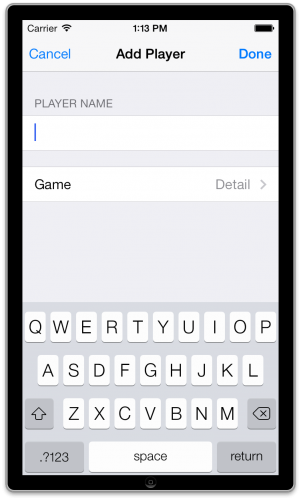 This sets a checkmark on the cell that contains the name of the currently selected game. Small gestures such as these will be appreciated by the users of the app. First this deselects the row after it was tapped. That makes it fade from the gray highlight color back to the regular white. Then it removes the checkmark from the cell that was previously selected, and puts it on the row that was just tapped. Finally, the method returns the name of the chosen game to the delegate. Run the app now to test that this works. Tap the name of a game and its row will get a checkmark. Tap the name of another game and the checkmark moves along with it. The screen ought to close as soon as you tap a row but that doesn’t happen yet because you haven’t actually hooked up the delegate. Note: If you’ve worked with nibs before, then initWithCoder: will be familiar. That part has stayed the same with storyboards; initWithCoder:, awakeFromNib, and viewDidLoad are still the methods to use. You can think of a storyboard as a collection of nibs with additional information about the transitions and relationships between them. But the views and view controllers inside the storyboard are still encoded and decoded in the same way. This is similar to what you did before. This time the destination view controller is the game picker screen. prepareForSegue: happens after GamePickerViewController is instantiated but before its view is loaded, so the self.game property already has the game’s name by the time GamePickerViewController gets to viewDidLoad. This is pretty straightforward: you put the name of the new game into the _game instance variable and also the cell’s label, and then close the Choose Game screen. Because it’s a push segue, you have to pop this screen off the navigation stack to close it. Awesome. You now have a functioning Choose Game screen! 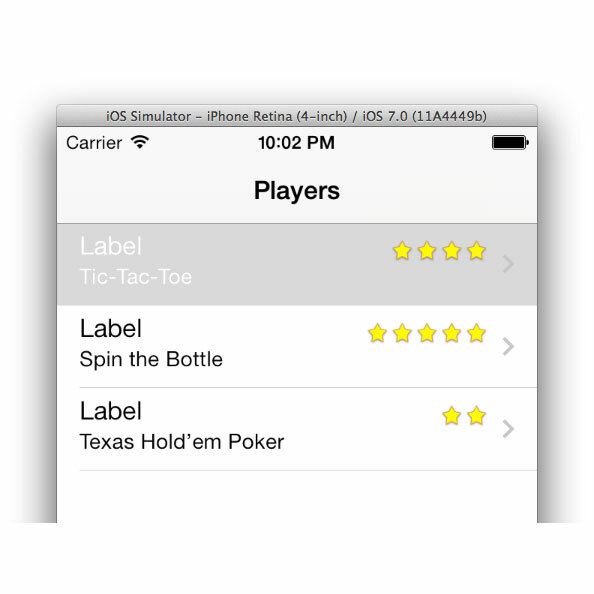 Here is an Ratings iOS 7 example project with all of the code from the above tutorial. And finally, how to manually load storyboards and use more than one storyboard inside an app. We do our best to keep our books updated for the latest iOS version, so soon we will be releasing an update for “iOS 5 by Tutorials” that updates the entire book to iOS 7! If you have any questions or comments on this tutorial or on storyboarding in general, please join the forum discussion below!